To add to this they also revealed via Twitter that we’ll be seeing multiple variants of Ripley. Whilst there have been previous Ripley figures (Kenner and Hasbro) none have ever featured her likeness. 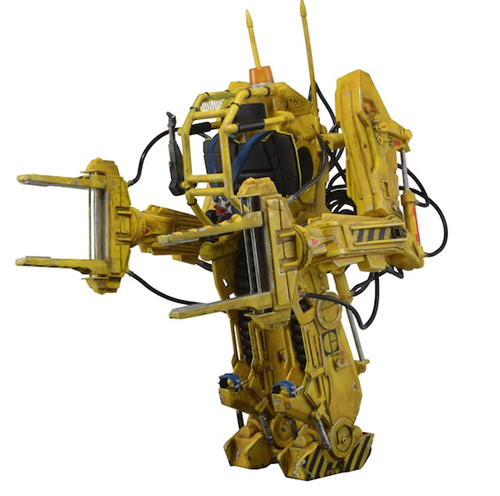 Further special releases to commemorate the 35th Anniversary of Alien include a “deluxe boxed” Alien Queen in July and the Power-Loader (above) just after. All this comes just after Toy Fair 2014. Be sure to check out Figures.com extensive galleries from the event. Heres part of my collection. Cant wait for more marines to be released! I really love your diorama by the way. Coming along nicely! Damn, looks like you got a bug infestation, there friend? Do you need a nuke strike? It's a great figure....so glad that I managed to get one. Thanks man! I'm gonna do a Jungle Hunter VS. Big Chap 'fotoshoot' next soon. Just a quick preview now..
For the next releases, unfortunately, the 2014 NYTF brought an information : "Colonial Marines fans, you've had a great run with recent releases but don't expect to see any more until at least next year." Color is glossy dark gray, and dark black on the dome (so dark that the contrast between the two colors is indistinct and it appears basically black). Unfortunately, the inner jaw has not been sculpted, but the glossy paint creates some reflects inside so we can guess it's here. Stands approx 2" inches long, and 1"1/2 in width. It's made of soft material, so the hands / arms / legs can be bended. Hands can grip on any cable to a diameter up to 3mm, that's the purpose of the Scalers (you can attach them to your MP3 / phone or computer cables), but due to the soft arms / legs, it will still hold on bigger diameters. For instance, I put mine on my desk lamp. It's a neat little figure overall, real cute and well crafted, and the concept you can carry it around is a nice idea, but it's not a must have I think. I don't know how much it's gonna cost for you guys in the US, but for 18€ (25$) with free shipping from HonKong, I find a figure of this size truly overpriced compared to the 7" inches figures NECA sells which are as cool as this one, if not better. First wave of 6 NECA scalers is on sale, particularly their Predator and Xenomorph figure ! Besides, they can be sold separately which is a good news for those who are not interested in the whole Series 1 (I just ordered a single xeno from HK, I'll share some pics when it arrives home !). Same here in France, only a few online shops sell NECA stuff they order from overseas in a small quantity (some are real stores, but driving 200 miles for a 20$ figure is out of the question). I don't have much choice but buying online and praying I won't get a crippled figure. I urge EVERYONE to buy directly from Neca on Ebay. If your figure is broken out of the package, just report it to Neca and they will ask for a picture of the broken figure. When you provide this to them, they will be forced to refund the money you paid for the figure, though perhaps not the shipping. They may send you a new one too, I'm sure, if it was expensive enough. This is what they did for me. But they make it much more difficult if you didn't buy directly from them. They'll tell you to deal directly with whoever you bought it from, and that just isn't fair. Neca is horrible with quality control and they need to be held accountable. $15 per figure or not, these issues just aren't an excuse or proper. I think its the mentality that unless it costs over $60 Quality itself should be set aside for Quantity. Unfortunately with buying online, you don't get to look through the figures to get the best (or least crummy as is the case with the recent aliens) so you might just end up with one with a bad paint job or warped/broken part. I've become hesitant from buying online because of this. Better return policy? or risk getting a crummy figure? i dunno. They really need to fix their customer service policy from the sounds of it... especially with such poor quality control. It's not the 3rd party store's fault that NECA made a defective figure (what do i do? keep buying and returning till a get a good one?) especially when its a well known, common defect in a particular figure. And I've never had an issue with any of their older Alien and Pred figures. Is that weird? I totally agree man, ever since I bought a NECA Big Chap figure with a wonky knee (It's just about to fall off I reckon) I've been hesitant from buying online.. It's a shame, because here in Scotland, apart from online stores, NECA figures are impossible to get on the high street. Yeah, I have five Neca Alien figures not a single has ever broke! Provided, I don't "play" with any of them or move them much at all. They basically come straight out of the box, positioned in my desired pose and set on my shelf. The quality control is now far better than it was in the past with the original alien figures: I had to buy 5 aliens warriors to get one which wasnt broken (in the box) and they were far more fragile and not built to survive a fall. The tubes on the head was often broken or some joint broke. Of the new series I got them in good condition and far less fragile, only complain on mine is the jaw problem but else they are fine, but I could be lucky. Yes, however I worry with the lack of Quality Control NECA is showing as of late I think we need to urge NECA to take care when the queen comes out. this will be a large figure and anything can upset the delicate balance of the figure. both stability and aesthetically. the last thing we want is an alien Queen with weak joints, parts that will break the mere seconds its out of the box, or worse. NECA needs to step up on their Quality Control, or I am NOT buying the queen. Got my first neca alien, and it has floppy knees, which means it won't stand out of the box. So what I did, was for every joint that was stuck, I used a dap of oil on a Q tip and worked it into the joints, and for every loose joint I squeezed a little white glue on the outside of the pegs and worked it in, moving the joint around until the glue drys and the joint is tighter. Since my alien came with an Hicks, I noted that the shoulder light was supposed to fit into a hole at the back, but the hole in the armor and the main body was half an inch apart, which required some creative cutting with a hole punch. If your kit isn't broken out of the box, I think it's fine to get one and work on it a little. Just don't play around with it too much. Same here, I've never had an issue with NECA's older alien figures. Just these new ones (and the big chap figures seems to be the worst off). Lucky he hasn't broken yet. My Giger Alien just took a tumble off the shelf, I didn't worry about it at first until I found the foot snapped off from the ankle! I really hope the next wave of Aliens have better QC. Haha. Mine does the same. He kinda stands... but i always come home to him either fallen over or on the floor. GO HOME ALIEN YER DRUNK. Wtf, does this happen often? It may have been just bad luck. Mine is in great condition. I've posed it like crazy and it still is not loose. In all honesty I've never had a recent NECA toy that has these problems. the figure at the end of the vid looks like he's shat himself. Not if NECA balances it right. Off the top of my head, they could counteract the top-heaviness by making the legs largely solid and the 'torso" more hollow. I'm not a toy engineer, but I'm confident NECA isn't going to mess this one up. If there is an EEV playset/vehicle and/or a shaved head Ripley action figure they will be definite purchases! On another note dont you thing the powerloader is a little top heavy that if u put a figure inside it would fall forward? the figure is Vastly superior compared to the original NECA version. the articulation is better, and won't break as easily as the other would. and the skull under the dome is actualy sculpted and not drawn on with a sharpy. Honestly, what the hell was with the sharpy drawn lines for the skull? I never knew that. I never owned the original NECA Giger alien. Wow I gonna Google some pictures of that one I gotta see that. I tried to find pictures of the improved HR Giger alien( Big chap) from Neca but couldn't find any in this thread so: Can someone show pictures of it and it it is improved posing abilities? It already looks better than the overpriced Hot Toys dog alien. Since the queen will be in scale to the 7" figures, how big will she actually be? Would get two loaders. One to recreate the queen fight, the other to Alicify... Hopefully they won't be priced too high. Walk around with Randy Falk on the NECA booth at NYTF. Some new juicy informations for 2014 : Alien Series 3, 4 and 5, the power loader, and a huge box set for the queen. The schedule is actually up to Series 6 and 7 and may include Kenner, video games and comic books characters.